Located in downtown Louisville, adjacent to the Center for Women and Families’ shelter, is an ideal location for a new living residence to assist women and children of domestic violence. 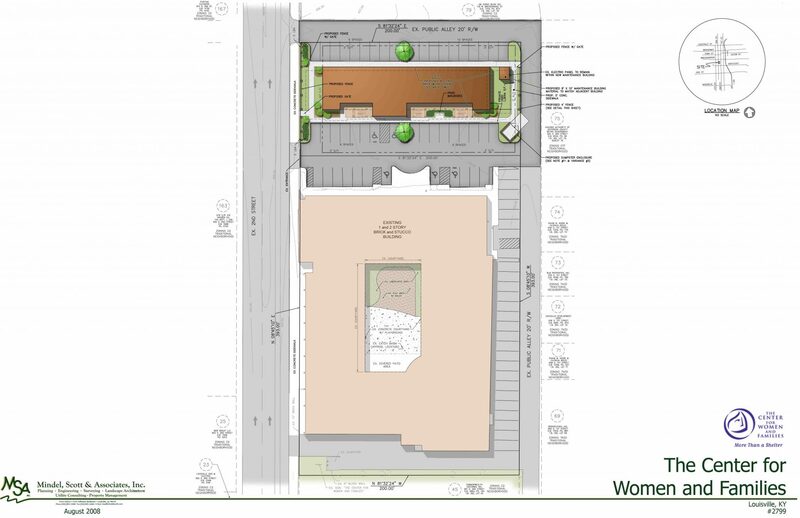 This proposal is to demolish the existing building and in the same location construct a new four-story apartment building, providing 22 apartments with a mix of one-, two- and three-bedroom units on 1.81-acres. To acquire approval of this development and to meet the current housing needs of the Center’s clients, several variances and waivers were required to bring this proposal into compliance with the Land Development Code. Mindel Scott was responsible for preparing the (Category 3) Development Plan, identifying, making application and providing justification for the required variances and waivers and taking this proposal through the local development code review process. Mindel Scott also provided a topographic survey, boundary ALTA survey, and was retained to complete the detailed site construction drawings, minor plat, easement plats and landscape plan.